Battling eels, frogs and even occasional wobbegongs [sharks] isn’t the most glamorous of jobs in the world. As a matter of fact it has been listed as one of the world’s ‘oddest’ occupations. And from the sound of things for Dutch backpackers Janeck Jansen and Jose de Vries, retrieving golf balls from Gold Coast waterways doesn’t pay all that well either. 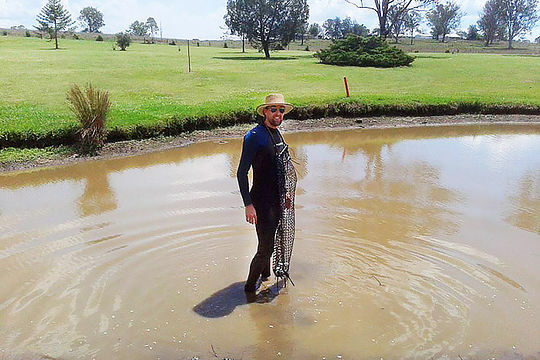 On a working holiday visa in Australia, the pair found what they thought was gainful employment fishing golf balls out of the muddy waterways of several Gold Coast golf clubs. The pair were rescuing about 2,000 golf balls a day. The balls were then cleaned and washed and sold in pro shops for between 60 cents and $2 each, depending on their condition. Yet some weeks they were paid as little as $170 each for 40 to 50 hours’ work. Now the pair have launched a court case against their employers for as much as $12,000 in unpaid wages. Jansen alleges that although he was initially satisfied with his employment with Advantage Golf Supplies, his cash-in-hand wage began dropping in early 2014. “My partner worked like 40 to 50 hours a week and was paid less than $200 some weeks,” said Jansen. Jansen said he would sometimes spend up to five hours a day in shallow water feeling around in the murky waters for golf balls. “Because you really can’t see anything, I picked up like a lot of frogs of course, there were like big eels in the water and there were sharks in one golf course, for sure,” he said. After attempting mediation through the Fair Work Ombudsman, small claims tribunal and contacting Work Place Health and Safety Queensland, Jansen and his partner are now fighting their former employer in the Federal Circuit Court.